From left, President Donald Trump's son Donald Trump Jr., son-in-law Jared Kushner and former campaign manager Paul Manafort. Hermitage Capital CEO Bill Browder, who fought successfully to have the Magnitsky Act signed into U.S. law, says he believes the July 2016 meeting between President Donald Trump's eldest son and a Russian attorney who promised incriminating material about Trump's opponent, Democrat Hillary Clinton, was actually part of a long-running Kremlin-backed campaign to subvert the 2012 law targeting Russian human rights abusers. The 2016 meeting at Trump Tower, the American-born, London-based investor told VOA, coincided with a marathon campaign by Kremlin-linked operatives aggressively seeking repeal of the Magnitsky Act. Named after Browder's lawyer, Sergei Magnitsky, who died amid allegations of beatings and medical neglect in a Russian jail after working to expose a purported tax fraud scheme by Russian officials, the 2012 law authorizes sanctions against human rights abusers in Russia and bans their entry to the United States. The Russian government has long denied the fraud charges, and an official Russian probe into Magnitsky's death blamed a heart attack. 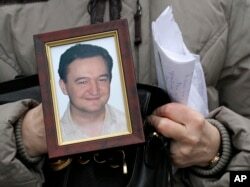 FILE - A portrait of lawyer Sergei Magnitsky, who died in jail, is held by his mother, Nataliya Magnitskaya, as she speaks during an interview with the AP in Moscow, Nov. 30, 2009. “Let's start by saying that [Russian President Vladimir] Putin doesn't like the Magnitsky Act ... because Putin was one of the beneficiaries of the $230 million [tax fraud] that Sergey Magnitsky exposed and was killed over. He has made his single largest foreign policy priority to repeal the Magnitsky Act,” Browder, whose firm was once the largest foreign portfolio investor in Russia, told VOA. So long as the act remains law, he said, any possible Putin-linked offshore holdings remain vulnerable to a sanctions freeze. The Kremlin typically declines to respond to these allegations, but in 2013 a Moscow court tried and sentenced Browder in absentia on tax evasions charges, accusing him of failing to pay $16 million in taxes. Magnitsky himself was posthumously convicted in that same ruling. Kremlin-linked lawyer Natalia Veselnitskaya speaks to journalists in Moscow, Russia, July 11, 2017. Donald Trump Jr. discussed the Trump Tower meeting with Veselnitskaya, which included the president's son-in-law and White House adviser Jared Kushner, then-campaign manager Paul Manafort, one former Russian intelligence official and at least four others, with Fox News's Sean Hannity last week. In that interview, the 39-year-old Trump described being disappointed when Veselnitskaya changed the subject of the meeting from Hillary Clinton to Russian adoption policy. Russia's ban on adoptions by American families, colloquially referred to as Moscow's “anti-Magnitsky Act,” was advanced by Putin's United Russia party nine days after former President Barack Obama signed the Magnitsky Act into law. The entire scope of the 2016 meeting, Browder says, may never be ascertained. Browder was in Washington to testify at a Senate Judiciary Committee hearing scheduled for Wednesday that was to examine Russian lobbying activities and compliance practices under the Foreign Agents Registration Act (FARA). The hearing, in which individuals Veselnitskaya brought to Trump Tower for the July meeting might have been discussed, was postponed late Tuesday. “None of the lobbyists [who participated in the Russian-sponsored campaign to repeal the Magnitsky Act] were registered as foreigners,” Browder said. “That was the original topic of the hearing that was scheduled several months ago by Senator [Charles] Grassley, because he was concerned about enforcement of the law. 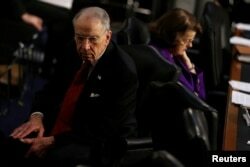 Senate Judiciary Committee Chairman Chuck Grassley, R-Ia., and the panel's ranking Democrat, Senator Dianne Feinstein of California, preside over Supreme Court nominee Neil Gorsuch's confirmation hearing on Capitol Hill, March 22, 2017. On Thursday, the Senate Committee on the Judiciary announced that it has rescheduled the FARA hearing and combined it with a hearing on attempts to influence U.S. elections. Asked his opinion of FARA compliance, Browder said the Trump Tower was meeting emblematic of the law's shortcomings. What's Behind Putin's Hate for the Magnitsky Act?